Description: Are you ready for a galactic journey? Hop on! 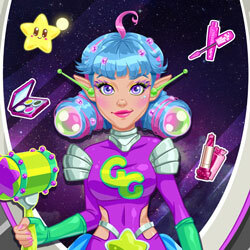 Our Galaxy Girl needs an real makeover and she wants you to help her. First you'll have to do your magic and apply on her some skin treatments and reshape her eyebrows. Then, surprise her with your imagination and play dress up with Galaxy Girl, change her hair and pick the perfect galactic pet.